Love lighthouses? We really do. 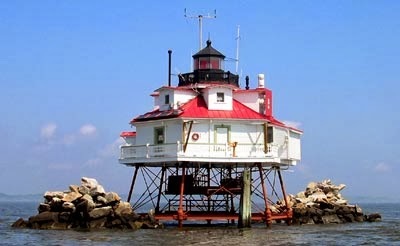 Annapolis's Thomas Point Shoal Lighthouse is a National Historic Landmark. Only ten lighthouses in the country have earned this designation. It is an active lighthouse that has recently undergone a major renovation and preservation effort. Tours depart from the Annapolis Maritime Museum via boat. It's a 30-minute ride out, a guided tour, and return trip. At the time of this writing, the tour departures are at 9:00am and 11:30am on Saturdays, June-September.